Mechanical Low Back pain is extremely prevalent in our society today. It also makes up the largest part of musculoskeletal problems treated by chiropractors and many other therapists. In fact, many medical doctor offices are overloaded with patients experiencing mechanical low back pain. Although chiropractic and other passive therapies can help temporarily remove pain and movement dysfunctions, a patient must take an active role in managing their long-term pain and rehabilitation. What is meant by Mechanical Low Back Pain? The main causes of mechanical back pain include muscular, bone, disc or nerve related structures. All of these tissues in the back can cause pain. This is by far the most typical back pain seen in my chiropractic practice. So how do we approach treating a patient with low back pain? Let’s use an example of a typical patient with low back pain who comes in to see me. Meet Jane: Jane experiences some pain in her low back periodically, but most of her pain is in the buttock muscles and back of her thigh. She was previously diagnosed with “piriformis syndrome”. Jane says her pain goes from the side into front of her hip joint, and also on the buttock and down the back of her thigh. The pain can also occasionally go all the way into her toes. Although Piriformis Syndrome is real, it’s rare. The pain is likely coming from the nerves in the low back. Upon assessing Jane we find she has lack of movement in her lumbar spine and hip/pelvis. She has weakness in her buttock and abdominal muscles and tightness in the muscles of her low back, back of the thigh “hamstrings” and also front of her hip “hip flexors”. However, stretching these tight muscles have not helped her much in the past. So What Do We Do For Jane? Our first priority as chiropractors is to get these joints, and muscles attached to them, moving. Then we educate Jane. We discuss postures to reduce load on her spine at work, at home and at the gym. When she is sitting, she should sit upright and avoid bending forward in any way. As illustrated in the picture below, the third image represents the ideal posture. We discuss ergonomic set up at work, as illustrated above. We suggest the use a lumbar support temporarily to train her to remove the pressure to the nerves and disc. We ask her take numerous breaks throughout the day. During those breaks, we promote movement based exercises, such as the Cat-Camel illustrated below. We also have her go for short walks and work on her running technique with a neutral spine. We also start to incorporate some very specific strengthening exercises for her core and hip muscles to support the spine (abdominals, back and hip muscles), such as the Bird Dog and Curl-Up illustrated below. After one treatment, Jane starts to feel some improvement. Therefore, we knew we were on the right path. After a couple of weeks; including a couple of treatments consisting of tissue massage, mobilizing and spinal adjustments, along with Jane being mindful of postures while faithfully performing her exercises, she improves significantly. When we follow up in the next couple of weeks, Jane’s pain is almost completely resolved. Jane is the typical low back patient we see in practice. Sometimes patients present with only low back pain. Sometimes the pain travels into the buttock, front or back of the thighs or even the feet, such as with the involvement of a spinal disc. 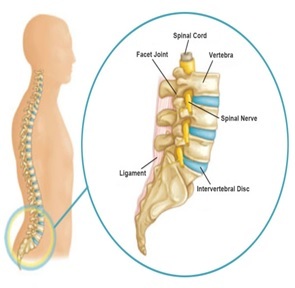 With all of these conditions the cause is usually mechanical, meaning it involves the back joints, muscles and nerves. In fact, it is estimated these cases account for 90% of all low back pain. It is also likely that these low back problems will resolve on their own over the course of 4 to 12 weeks. However, it is our job as chiropractors to rule out other unlikely causes of the back pain that could prove more sinister, and to speed up recovery time. Chiropractors have training to identify these possible causes, and refer to medical doctors for further investigation and possible imaging, such as an x-ray or MRI, when necessary. Research shows that chiropractic treatments (soft tissue therapy, mobilization, manipulation or adjusting), paired with patient education and proper exercise, help to rehabilitate and improve a patient’s recovery time and prevent future recurrence. Chiropractors have evolved to provide “active care” by coaching patients through pain avoidance strategies and educating them on appropriate exercise programs. Patients and medical doctors should feel confident utilizing the services of a chiropractor, or other therapists, who treat mechanical low back pain by encouraging proper movement and work to build stronger core and pelvic stabilization as strategies to long-term patient rehabilitation. Most employee benefit plans include chiropractic care. If you have any questions, please feel free to contact me for further information. Older PostRunning Injury Prevention….Now that Spring has Sprung, are you experiencing the “Running Bug”?